In “Capernaum”, a boy who has been hardened by life on the streets of Beirut is suing his parents for bringing him into the world. If that sounds tough, it is. Zain, who’s about 12 years, endures more than any kid should have to. Life at home is unbearable, and when his parents sell off his beloved 11-year-old sister to the landlord’s son to be his wife, he bolts. Labaki’s camera follows the boy unobtrusively through a series of unfolding episodes. He makes friends with a nice African woman and agrees to take care of her toddler while she’s at work. When she doesn’t come home one night, Zain finds himself a full-time babysitter for a child who needs his mother’s milk, an occasional bath, and constant attention. He is still a child himself; what is he to do? “Capernaum” may be viewed as Dickensian in tone or reminiscent of neo-realist films from the 1940s and ‘50s. What happens onscreen is painfully real. Zain is not an idealized hero: he steals and connives on a daily basis, doing whatever it takes to survive. “Capernaum,” which roughly translates to “chaos,” is a deeply empathetic movie, made all the more remarkable by Labaki’s work with non-professional actors. One can only imagine how the filmmakers devised this harrowing tale. 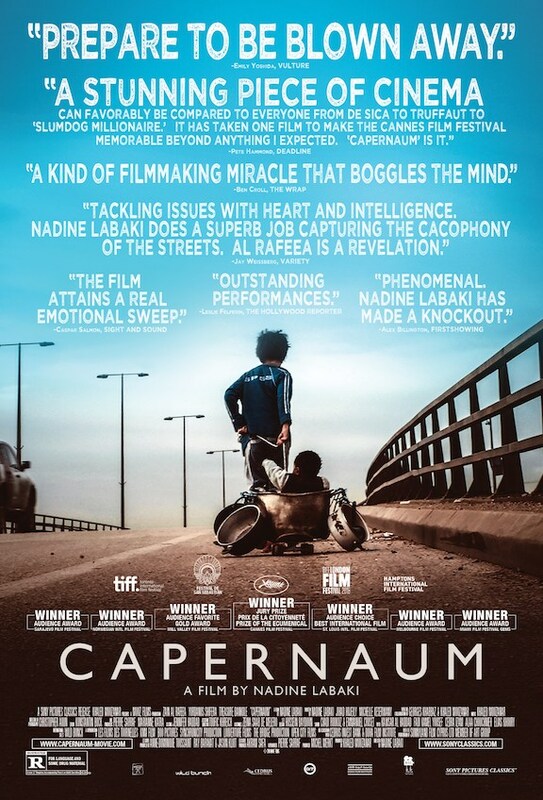 But by some alchemy, “Capernaum” is not dreary or depressing: it’s impossible to look away from because it is so alive, like its indefatigable young protagonist.